Have you heard that bet-at-home.com is now official sponsor of Hertha BSC? This August bet-at-home.com and Hertha BSC announced that bet-at-home.com would be the new main sponsor of the German football club for the next three years. Hertha BSC, donned in the blue and white labelled bet-at-home.com jerseys, is currently playing in the first Bundesliga in Germany. In the past, the team won the German Championship twice and also took part in the Champions League and the UEFA Cup. We are proud to be a partner of the Berlin based football club and are happy to support the team in the coming years. Haben Sie schon gehört, dass bet-at-home.com offizieller Sponsor von Hertha BSC ist? 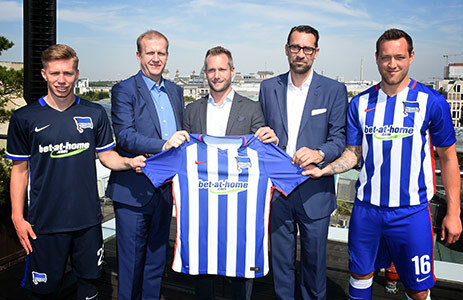 Diesen August verkündigten bet-at-home.com und Hertha BSC, dass bet-at-home.com der neue Hauptsponsor des deutschen Fußballteams Hertha BSC für die nächsten drei Jahre sein wird. Hertha BSC spielt derzeit in der ersten deutschen Bundesliga und trägt blau weiße bet-at-home.com gebrandete Trikots. Das Team wurde bereits zwei Mal deutscher Meister und nahm bereits an der Champions League und im UEFA Cup teil. Wir sind stolz den Berliner Fußballclub Hertha BSC als Partner zu haben und freuen uns das Team die nächsten Jahre zu unterstützen. ‹ WELCOME / WILLKOMMEN !